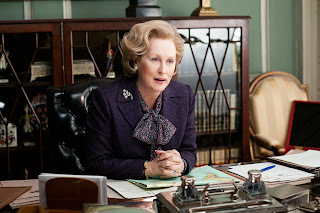 The biography of Margaret Thatcher features a tour-de-force performance from Meryl Streep, and an evocative narrative style, history through the mists of dementia. The Iron Lady is more personal than historical, but captures the essence of its subject with stunning clarity. 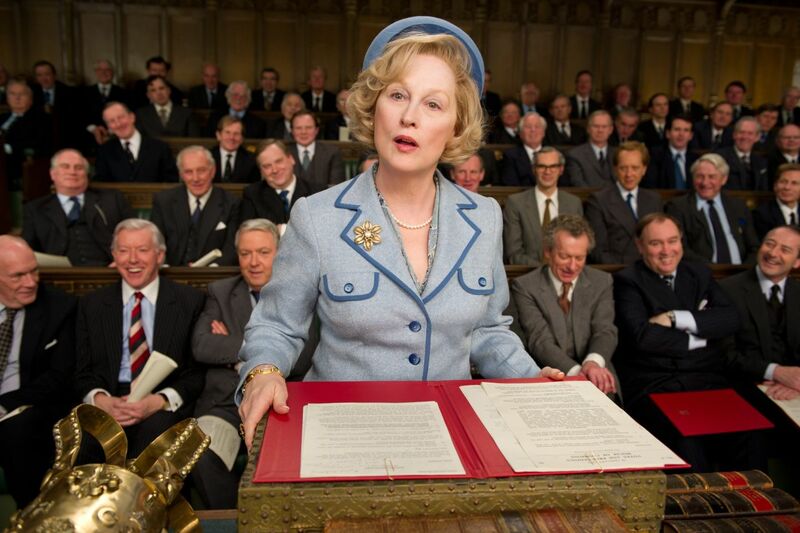 Thatcher (Streep) is in the twilight of her life, living alone, cared for by nurses and a security detail. Suffering from dementia, she cannot discard the presence of her long-dead husband Denis (Jim Broadbent), who hovers around her providing sardonic commentary on her life and thoughts. As Thatcher attempts to sort through Denis' closets to pack his personal belongings, reality, history and the fog created by a mis-firing brain come together. Thatcher remembers her remarkable life through fragments of history emerging in bolts of searing coherence. From humble beginnings as the serious daughter of a grocer, Margaret Roberts was inspired by her father's principles of self-reliance, individual responsibility, and a nation built on personal endeavour rather than government hand-outs. Starting in the 1950s, she ran to represent the male-dominated Conservative party in parliament, and she met the young and jovial Denis early in her political journey. After eventually securing a seat, she rose through the party ranks and was elected in 1975 to lead the Conservatives. She arrived at the pinnacle of British power by winning the 1979 election, becoming Britain's first female Prime Minister, and would remain at the head of government for eleven years. During her tenure, she modernized Britain's economy, took on labour unions, led Britain in a war against Argentina over the Falkland Islands, and battled the terrorism of the Irish Republican Army. As directed by Phyllida Lloyd, the decision to recount Thatcher's story in non-chronological order and through the recollections of an elderly woman ravaged by old age works both for and against The Iron Lady. By necessity, it opens to question the need for Abi Morgan's script to focus almost half the movie on Thatcher's sad health decline. Is there not enough in Thatcher's remarkable life to spare her the ignominy of dwelling on a decaying mind? 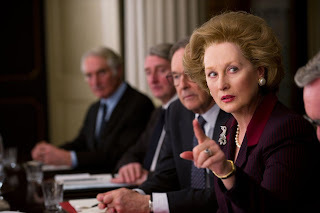 But simultaneously, the structure of The Iron Lady allows triumph to emerge from adversity, director Lloyd finding the essence of a woman who can live with her current condition due to remarkable reserves of fortitude that helped her to build a remarkable legacy. The film's structure therefore echoes Thatcher's triumphalism, and her achievements are so entrenched in her country's modern destiny that reliving them through the haze of a faded personal glory serves as a jarring reminder of what a simple grocer's daughter was able to accomplish. This is a film about the nation-shaping potential that resides within an individual, and the story's format emphasizes the values of stubborn resiliency that defined Thatcher. The Iron Lady is an acting master-class from Meryl Streep. Stepping onto the top step of all-time acting achievements on the big screen, and delivering a performance rarely if ever matched, Streep embodies Thatcher from her entry into politics to her doddering old age, picking up on her speech, her mannerisms, her inner strength, and ultimately her battle against her own senses. Streep deservedly won her second Best Actress Academy Award, close to three decades after claiming the same award for Sophie's Choice. Alexandra Roach as the young Margaret Roberts, Broadbent as the persistent ghost of Denis, and Olivia Colman as daughter Carol round out the non-political cast. The politicos of Thatcher's era, from heads of state to cabinet ministers and political allies and foes, are all presented in short but sharp definition. Rising above a lesson in history, The Iron Lady is a study of a woman's ability to place a stamp on the world, driven by her own strong convictions and self-belief. Her final years may be inglorious, but the glory years were a spectacular inspiration.